There’s no denying that our service members have difficult jobs. No matter your branch or role in the military, you devote long hours to your work, spending days, weeks, and months away from your family. This also puts a strain on the spouses and family members of a military service member. 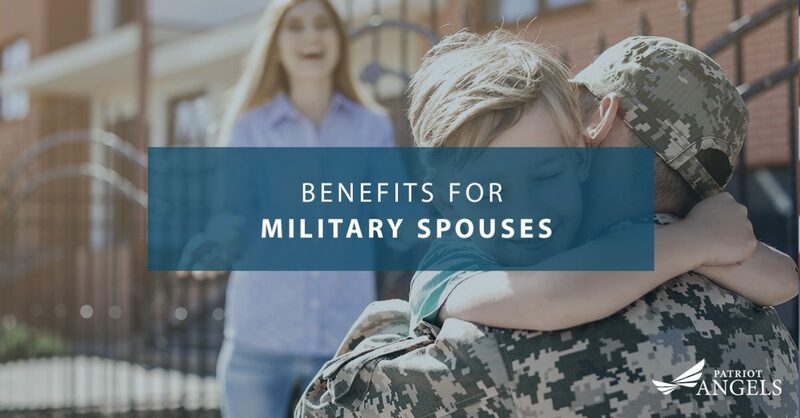 To ease some of this burden however, military spouses are entitled to benefits that make their lives easier and serve as a small measure of compensation for their time apart from their loved ones. In today’s blog, Patriot Angels will highlight some of these benefits that military spouses can take advantage of. Most military bases are small communities in and of themselves, with schools and stores being alongside military command spaces. Most bases offer childcare services of some kind, including full-time and hourly. These services are typically based on the total family income, and not the service member’s pay grade. If the on-base childcare facilities are already filled, you can use a subsidy to get in-home care for your child. For those military families living off-base, you can find childcare centers and daycares that are set up to accept military childcare subsidies. The Basic Allowance for Housing, or BAH, is provided to every active-duty service member as part of their regular pay. The amount received is based on where the service member is stationed. For spouses who live apart from their service member partner, you can still receive a BAH stipend. That amount is based on where the service member is stationed, and not where the spouse lives. The BAH is designed to cover the majority of a service member and their family’s living costs. The BAH rate is recalculated annually, but your rate is maintained even if the average rate falls for a particular duty station. Most bases are outfitted with stores that carry discounted goods and services specifically for service members and their spouses and family members. In many cases, the on-base commissary helps to save spouses money on grocery bills since they sell their items at cost. Additionally, the exchanges at each post sell goods that are largely tax-exempt, making them ideal for purchasing large items like new furniture or appliances. Families with an active-duty service member are entitled to receive health care benefits through the Tricare system. This allows families to get regular health checkups as well as more intensive medical services when needed. For military spouses who require long-term medical care in their later years, if their veteran partner has passed away and was discharged honorably, they may be entitled to the VA Aid and Attendance Pension. This pension provides funds to offset the cost of daily and intensive care. If you or a loved one feels they could benefit from the VA Aid and Attendance Pension, connect with the Patriot Angels today. We can help you get the funding you need for the quality treatment you deserve.